The fire of loss is the fire of Hell. The saving fire is the purgative fire of Purgatory. The purgative, saving fire brings a soul to full holiness; for “without holiness, no one will see the Lord” (Hebrews 12:14). This is why a soul who desires to dwell with God and glorify God desires to be purified before seeing the face of the Lord. A soul burden with the residuals of sin is encumbered in its ability to glorify God. Through His infinite mercy, God purges the residuals of sin with fire and lovingly draws the soul in. 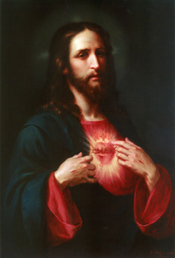 Oh, how our souls should yearn for the fire of Christ’s scared heart, a heart that burns with love and mercy! Oh, to be consumed and purified by the fires of His heart. This entry was posted in Essays, Meditations On Biblical Verses, Uncategorized and tagged 1 Corinthians 3:11-15, Catholic, Catholicism, Christian., Christianity, Hebrews 12:14, Purgatory, Purified by Fire, Sacred Heart of Jesus, St. Paul. Bookmark the permalink. A fascinating delineation of St Paul and his Epistle to the Corinthians which provides strong evidence for the doctrine of Purgatory. Thank you for the kind link. May God bless you and your Brother Benedictines.